Missing Global Warming Close To A Solution? I can’t tell you where I obtained a photocopy of the note below. I can tell you that I am in Washington DC (at the lovely and recommended Morrison Clark Inn). My guess is the IPCC will pay. The ransom is peanuts next to the monies government expects to generate with Global Warming regulations. Your thoughts? Amateurs! They should have threatened to keep all the warming, take all future warming and plunge the planet into a new Ice Age, thus completely humilating everyone involved. Could have gotten ten times the ransom amount! PUT THE LOTION IN THE BASKET!!!! Did they chop off a proxy and mail it with the note? Links in the paper lead to the data used to allow independent corroboration. a bunch of ‘name-brand’ researchers have identified completely different factors that appear to explain much, if not all, of the hiatus in warming. Which means, as they concede, the models as they are are deficient. I think Obama’s good buddy, Bill Ayers, is behind it all. There is so much wrong with that sentence. I guess Nature must figure that if they start allowing that scientists might also be skeptics, they might lose market share in the coveted LOFO demographic to Scientific American. As proof of life they could have included a picture of Elizabeth Mitchell. She’s hot! 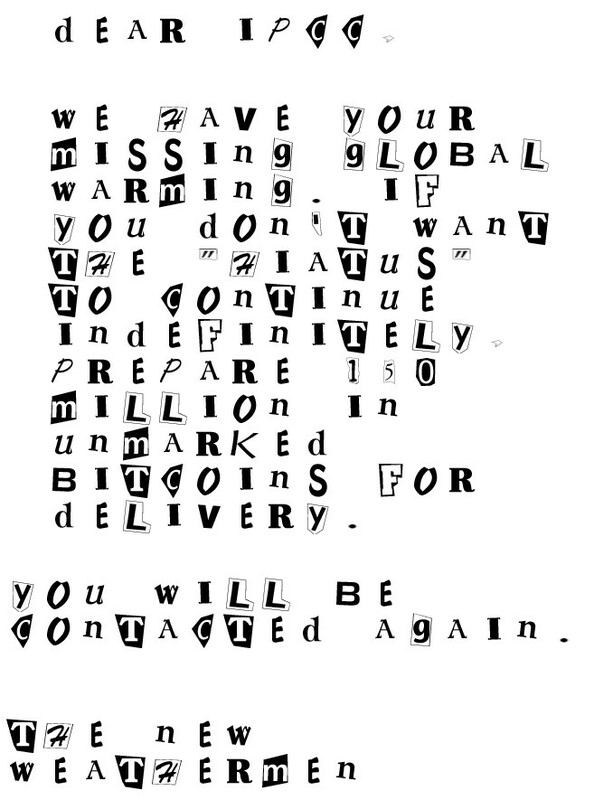 A black and white ransom note – you should read more colour magazines. Is this like the Hound of the Baskervilles, the dog that didn’t bark? “umkarked bitcoins” ? do they mean zerocoins? do they want them with or without NSA tracking the transactions? I’d prefer the type the NSA isn’t tracking, thanks….. Oh s***, did I post that out loud? The “missing heat” is an artifact of belief, not reality. If you believe that humans cause global warming, but there’s none to be seen you can either look for the missing heat or abandon your belief. Not a hard choice for the warmists to make, is it? 1 – temperature readings for periods before about 1970 have been adjusted downward where they exist and imagined into existence where they don’t to create an image of a cooler world. 2 – temperature readings for from 1970 to about 1998 were generally adjusted upwards where the exist, dropped if too far off track, or imagined into existence to support an impression of global warming. 3 – after about 1999 people like Watts were looking cynically at the data and adjusting it became much riskier. Since we do not know how much up, how much down, or how far around the surface, these effects went we cannot be sure of much. However, it seems more likely than not that the pause is a pause only in book cooking by warmists – so, bottom line, you can find the missing heat by looking at the tempers of warmists demanding the people like Watts be jailed or executed for making them face reality. I missed you at the Morrison Clark Inn by a week. Very affordable for what you get and it’s location though the wi-fi was spotty in my room. After 1998, any decrease was blamed on 1998 being an extremely strong El Nino event and of course it cooled off after that so you’re cherry-picking. (El Nino for this year seems to have been cancelled after the hype of super El Nino and historic extreme weather–though undoubtedly 2015 will still be the hottest on record, even if all continents are buried under 30 feet of snow.) I think you understand the whole global warming thing quite well.